The Clydesdale Bank shut its branch in Aberlour in May last year, less than six months after Bank of Scotland also moved out of its premises there. The two blows came while firms in the village experienced two years of roadworks misery due to drainage and resurfacing works on the main thoroughfare for tourists. Some businesses failed to recover from the disruption amid claims tills in the High Street were hit by £500,000. However, now traders in Aberlour insist that the village has come through the other side of the hardships stronger as a result. Wool and coffee shop The Gather’n, which was previously known as Three Bags Wool in its previous location, has expanded into the former Clydesdale – bringing back an ATM that was pulled out in the process. Meanwhile, a new butchers has opened up about a year after the village’s last closed down. Brian Doran, chairman of business association About Aberlour, praised the resilience of the community. He said: “I think the strength has come from having a good range of businesses now. They have really acted as a collective draw. Mr Doran also expanded in the last year, moving his gallery business into larger premises on the High Street. Stewart Mackie, owner of S. A. Mackie Butchers, said: “We opened up at Easter so we’ve come after it all. I’m just glad we did because it affected everybody. It was a hard time. “I know that when the last butcher closed down a lot of people thought it would be the death knell of the village. There wasn’t much variety on the High Street. 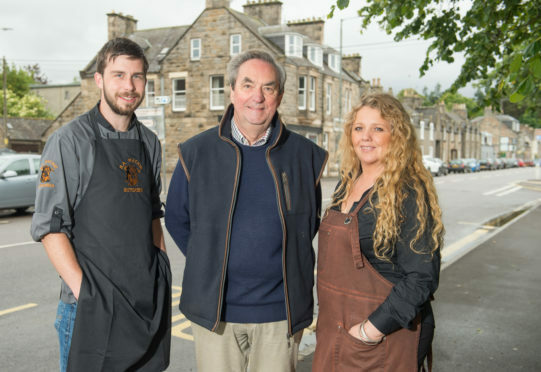 Jennifer Robertson launched Spey communications agency last year and believes Aberlour has been an excellent “springboard” for the firm, which has since won national awards.